Ginger has a long history of use in many Asian, Indian, and Arabic herbal treatments, and has been used as a cooking spice for at least the past 4,400 years. There are many benefits associated with consuming ginger. In fact, many healthcare professionals recommend taking ginger to relieve nausea, and motion sickness. While there are many ways to reap ginger health benefits, a popular method is through infusions. Ginger tea has been proven to have plenty of medicinal properties, and the consumption of ginger for upset stomach has been especially useful for counteracting nausea and relieve gastrointestinal spasms. There is a long list of benefits associated with consuming ginger. However, drinking a ginger tea or infusion is best for soothing digestive issues thanks to the high levels of polyphenolic compounds that this herb contains. Due to the anti-inflammatory and anti-emetic effects of this root, ginger tea is primarily used to treat stomach issues such as motion sickness, dyspepsia, and vomiting. Dyspepsia is painful indigestion, usually accompanied by symptoms such as nausea and vomiting, heartburn, bloating, and stomach discomfort. There can be many causes of dyspepsia, such as bacterial and viral infections that may develop into an ulcer, in which case ginger is especially useful as a result of its antiulcer and cholagogue effects. 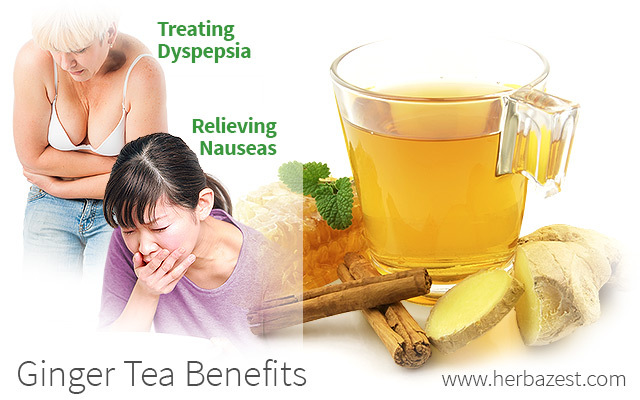 In other cases in which the cause of dyspepsia is not as apparent, ginger is simply helpful due to the fact that it aids in stimulating peristalsis and the secretion of gastric juices, as well as saliva, which in turn supports digestion. In addition to these ginger tea benefits, studies have recorded that the ingestion of this root is useful in easing the symptoms of morning sickness in pregnant women, reducing the severity of nausea during chemotherapy, and also alleviating menstrual cramps. How you prepare your ginger tea is really dependent on your intended use and the benefit you are looking to receive. Many people find that ginger has a pungent taste. This taste can be improved with the addition of sugar or honey to ginger tea. In general, it is not recommended that adults ingest more than four grams of ginger per day, in any form (dried, cooked, raw, infusion, etc. ), and pregnant women should not take more than one gram per day. In any case, be sure to consult your doctor before consumption. Ginger tea consumption, as well as other medicinal uses of ginger, is supported by its long history of applications in herbalism and modern science. While there are many methods of taking this root, ginger tea is best suited for treating digestive issues such as motion sickness, vomiting, and dyspepsia. The next time you have an upset stomach, consider taking advantage of ginger properties as a warm tea, an excellent, all-natural remedy to fight nausea and indigestion.